Obituary – Alexander Sr., Ashley « Perry High School Alumni Association, Inc.
Ashley Alexander, Sr. passed away at his home, east of Perry, at 2:30 a.m. Friday, March 29, 2002. He was born November 20, 1912 in Bladen, Nebraska and came to Perry with his parents in a covered wagon at the age of two years. Ashley grew up in the Perry area, attending the country schools and helping his parents on the farm. His early love was the piano, and at age five, he started taking lessons. Since he had no piano at home, he drew the keys on cardboard boxes to practice. ﻿Ashley attended college at Northern Oklahoma College, Tonkawa, and graduated from Central State University at Edmond where he was named Distinguished Former Student in 1973. His teaching years began at Willow Creek country school near Perry. Later, he was band director, teacher and principal at Billings, band director at Marshall, Shidler/Webb City and Pawnee. 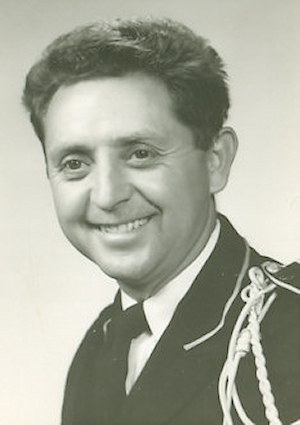 In 1957, he went to Oklahoma State University, Stillwater, where he became Director of Student Entertainers, managing many performances throughout the country and USO overseas tours for the military. Ashley remained active until his death, playing the piano at nursing homes and service organizations. In 1975, he and his wife, Beverly, formed a non-profit corporation, the Ashley Alexander Association, that allowed them to musically perform worldwide together for nearly 27 years. Ashley served the Stillwater Rotary Club as pianist for many years and is a Rotary Paul Harris Fellow. Ashley was preceded in death by his first wife, Lucille, three sons, Ashley Jr., Alan and Artie, his mother and father and one brother, Harrison. Survivors include his wife, Beverly, and one son, Richie, of the home; grandchildren, David, Jim, Alese, Jeff, Justin, Jennifer, Rachel, Becky, Ruth and John; several great-grandchildren and a host of other relatives and friends. Services will be held at 10:00 a.m. Tuesday, April 2, 2002 at the First Baptist Church in Perry under direction of Brown-Dugger Funeral Home. Interment will be at Grace Hill Cemetery in Perry. Memorials may be made to the youth fund at Perry First Baptist Church, Perry Senior Citizens Center or the Stillwater Rotary Club at P.O. Box 1451, Stillwater, OK. 74076.